Digital vs. Pipe Organ • Who Wins? The Boston Globe entered into this debate in Malcolm Gay’s article, A revolution rattling the world of organ music. The article was featured on the front page of the Sunday, October 4th edition. With regard to the sacred liturgy and worship, Cameron Carpenter’s highly acclaimed performance and recording career does not particularly apply. But it is because of him that this discussion has been brought into the mainstream media for which he deserves much credit. T IS THIS LAST SENTENCE that is the crux of the argument. Nor is it only “traditionalists” who would agree with this statement. (The words of the organ builders themselves are further telling in this respect, which I will explore later.) The answer lies simply in the physics of natural sound and its full array of harmonic frequencies versus listening to the world as filtered through speakers and processors, no matter how advanced. In the end, the harmonics are compressed. It is the difference between virtual reality and reality. Real pipes can be felt. As such, these pipes have a relationship with its congregation. This relationship supports the faithful with the richness of true harmonics, the displacement of air coming from thousands of locations, and strangely enough, the imperfections of tuning and speech which commiserates with frail humanity longing for the spirit. In the end, the emotional and spiritual experience is simply not the same. In this context of worship, the issue goes beyond what is pleasing to the ear. At stake is the relationship between prayer and sacred music that gives glory to God. At stake is the relationship between one’s soul and music of the pipe organ that “powerfully lifts up man’s mind to God and to higher things.” (Sacrosanctum Concilium, §120) These words from Vatican II remind us that God deserves our best. In our prayer as in our music, to what shall we aspire? “I don’t think our goal is to exceed the pipe organ. I mean, the pipe organ is a wonderful, magical instrument. I think the mission we’re on is to do something that is as legitimate. But Marshall & Ogletree may very well be getting closer. Their attention to detail appears to be unquestionable. However, going hand in hand with such extensive labor are the cited costs of their instruments which do not appear to be very competitive with pipe organ builders. $750,000 to $1.5 million is not exactly a readily affordable alternative, which has historically driven digital organ sales. These prices are quite comparable to the cost of a well-built pipe organ and likely exceed the price of a restored or rebuilt pipe organ. Furthermore, one must take into account the cost of replacing the digital instrument in a generation. This does not compare favorably against the regular maintenance costs of a pipe organ. Furthermore, beautifully voiced pipework lasts for centuries. Digital technology becomes outdated quickly! I applaud the daring to push technology to its limits or to imagine alternative uses as Cameron Carpenter has. If in doing so he can bring the repertoire of the organ to new audiences that would otherwise ignore the organ, this can only be a positive development. Strong competition such as this is good for everyone. All must work harder to build a more glorious musical instrument. Who wins? Everyone. INALLY, THE FIRST ENCOUNTER WITH A REAL PIPE ORGAN is often a life changing experience. I will never forget the moment I first placed my finger on a keyboard, wind blew through a wooden pipe, and a soft but otherworldly sound sang throughout a dark, vast building. My life has never been the same since. Likewise, the American Guild of Organists cultivates many young artists at the earliest of ages. There is groundswell of youth who will not only serve their perspective congregations admirably, but who are blossoming into mature artists and leaders in their communities. This is the real revolution—not virtual technology. PETER KRASINSKI, DEAN of the Boston Chapter of the American Guild of Organists and I spent over two hours with Boston Globe reporter Malcolm Gay as he was researching this article. Krasinski brought him to St. Cecilia Church in Boston to demonstrate the Smith & Gilbert Organs (1999 & 2001). 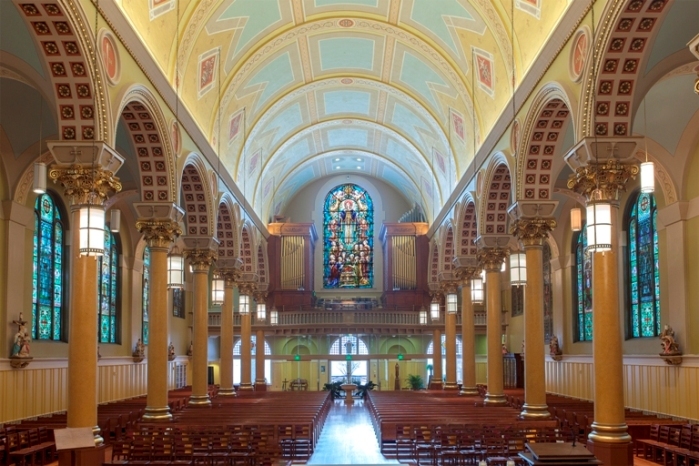 St. Cecilia Church was the site of six events for the National Convention of the American Guild of Organists in 2014. In addition it hosted the Opening Service of the Boston Chapter of the AGO which featured conductor and composer Julian Wachner and the GRAMMY®-nominated Trinity Wall Street Choir. The fifty-two rank instrument, designed by Timothy Edward Smith, speaks directly into a barrel vault ceiling in a space with four seconds of reverberation. There is an antiphonal division near the sanctuary playable from the gallery and from its own two manual console. The instrument is designed and voiced especially for this worship space and the liturgical needs of the Roman Catholic liturgy in the Twenty-First Century, all while in a Nineteenth Century architecture. Most importantly, it is designed to have a relationship with the people who worship at St. Cecilia. Krasinksi and I had a great deal more to say and demonstrate during our time with Malcolm Gay. Our discussion with him was more than delightful. His intellectual curiosity lead him to tour the instrument inside and out and was keen to grasp the intricacies of such a grand instrument. I thank him for bringing into focus something that many of us are passionate about. I hope this conversation continues!